In the oil and gas industry, “sour gas” refers to natural gas that is contaminated with hydrogen sulfide (H2S or “sulfide”). “Sour crude,” similarly, is crude oil that contains hydrogen sulfide. These are naturally occurring conditions, but definitely not desirable. Aside from the environmental pollution problems with “high-sulfur” fuels, there are some serious corrosion problems that can affect many materials. Liquid drainers (drain traps) and strainers are the most common Armstrong products ordered for sour gas service. A few other products are sometimes specified, notably inverted bucket air traps. An inquiry may be accompanied by an extensive specification of H2S concentrations; there may be a line indicating “Sour Gas Service;” or may only be the note “NACE.” This is a reference to Standard MR0175-93 published by the National Association of Corrosion Engineers (NACE). H2S under pressure permeates into the crystalline structure of the metal and strains the structure of the crystal. This reduces its ability to deform in a ductile manner. The net effect is to make the material brittle. In the presence of external stresses due to applied pressure or loads, or internal stresses due to cold working or welding, parts may fail by cracking without any warning. This process is called Sulfide Stress Cracking (SSC). SSC is affected by many parameters, including: · Composition, strength, heat treatment, and microstructure of the material; · Hydrogen ion concentration (pH) of the environment; · Hydrogen sulfide concentration and total pressure; · Total tensile stress; · Time and temperature. Choice of products and their limitations. Inverted bucket traps (primarily for air trap service) should be selected from the Series 300 traps. The bucket and mechanism (except valve and seat) will be annealed to eliminate the locked-in stresses from the stamping operations. The valve and seat will be made from Type 316 stainless, without additional heat treatment. 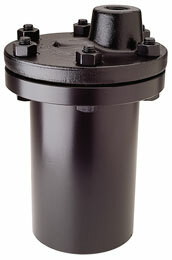 Cast iron bucket weights are permitted, since they are not stressed in tension. Special bolting is required only if the sour environment is also outside the trap.